In the last few years, Korean films, TV dramas and pop music have become immensely popular abroad, a phenomenon known as the Korean Wave. This is the 30th in a series of essays by a select group of scholars and journalists looking at the spread of Korean pop culture in Southeast Asian countries and beyond. - Ed. His goofy smile, manly good looks and dynamic acting catapulted him to fame when he played a dopey student in the hit MBC drama "Cat on the Roof" in 2003. And now "Hallyu" star Kim Rae-won is joining the ranks of Korean Wave celebrities, alongside Bae Yong-joon, Jang Dong-gun and Lee Byung-hun. With a new Japanese movie out and the much-anticipated SBS drama "Gourmet" ("Sikgaek") on its way, the future is looking bright for Kim. According to the Sankei Shimbun newspaper, "The actors who appeared prior to 2002 can be grouped as the first generation of Korean Wave stars, and the second generation are those who came out much later, including Kim Rae-won .".. 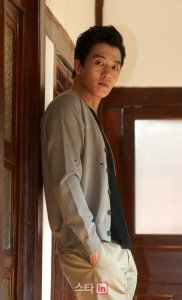 But, as a second generation member, Kim Rae-won still hasn't gotten used to his newfound fame. "I still find the title 'Hallyu star' somewhat awkward", said the actor, 27, in an e-mail interview with The Korea Herald. It looks like Kim will have to get used to the title sooner rather than later. According to a media report, in October 2007, at a fan event in Tokyo, approximately 3,500 fans gathered to see Kim strut his stuff. And now, with his first Japanese movie, "Hanakage", out, Kim's popularity in Japan only promises to grow. But before all this happened, he was pretty much a homegrown star. When the time came to hold his very first Japanese fan meeting, this actor was less than prepared. According to news reports, Kim reportedly said of his first fan meeting, which was held in Osaka in June 2005, "Honestly, I wasn't completely comfortable ... said to those around me that this would be the last time". "When I was visiting Osaka for promotional reasons, something happened that brought tears to my eyes", he recalled. "It all happened at a Japanese Okonomiyaki restaurant, where we went after the event. The owner was an elderly first generation Korean-Japanese woman. She was very kind and hospitable to us. And, on our way out, she grabbed both my hands, teared up, and said, 'For a long time, I endured a lot of sorrow as a Korean ... but nowadays, thanks to Korean stars like you, I am well-received as a Korean'. When I heard that, I thought that the work that I was doing was very rewarding". So, how does Kim feel now? "All I can say is that the pride that I feel as an actor and the gratitude I have to my [Japanese] fans will not change". Still in the early stages of his career as a Hallyu star, Kim's main overseas fan base is Japan. "At this point in time, I think [my fans] are mainly in Japan", he said. "My Japanese fans always greet me warmly when I visit. It makes me feel really good". These fans are clearly not just enamored of his superb acting skills, though they are top-notch. Considering that his fans are mostly Japanese women, Kim's good looks obviously are essential to his popularity. When asked what he thinks attracts Japanese females to him, he said, "My guy-next-door appeal". But this tall, broad-shouldered man doesn't look like the guy-next-door. That is, until he gives you one of his big toothy smiles. Kim's charm hasn't just enchanted Japan. The star has quite a following in Thailand. But he had no idea that he had so many fans until he visited the country himself. "I remember when I went to Thailand, I attended a simple event there because a friend asked me to", said Kim. "There was a little event at a department store, so I didn't prepare for it at all". "So, imagine my surprise when about 1,000 fans greeted me. And there were like 10 to 20 reporters there, too. Because of that, I ended up holding an unscheduled press conference". The seemingly shy actor added, "At that time, the whole situation was pretty scary. I had no idea that Thailand would be that happy to see me". "I guess you could say that 'Rooftop Room Cat' was my starting point", said the actor. "And there is also 'Love Story in Harvard'", he added, referring to the hit SBS drama that aired in 2004. Thanks to the international success of both these dramas, Kim Rae-won had the honor of holding his very own Hallyu Expo Event called "Won and One Fine Day" on Feb. 3, 2007 on Jeju Island. It was truly memorable to him. "I had a great time with my fans at the Hallyu Expo Event", said Kim. "I don't think you could beat that experience. And I got to grow closer to my fans". According to the media, about 300 fans from Japan, China, Taiwan, Hong Kong, the United States and Russia attended the event. And it was well worth the trip. Kim sang, performed a little magic, and cooked for his fans. But he hasn't let all this go to his head. He has no overblown ideas about what he has to do to cut it. Kim keeps things simple and straightforward. "I think that it is my duty to act to the best of my abilities, to move my fans and make them laugh". That's not to say he doesn't think that the Korean Wave is important. Kim has his own opinions about the Hallyu phenomenon. "I think an approach that involves continual interest, and a long-term perspective is needed", he said. "I think that it needs to develop its content and also develop as a tourist industry. That way, the Korean Wave won't just be a passing fad". Fad or not, Kim is here to stay, as is clear in his latest movie, "Hanakage". Directed by Hayato Kawai - who also made "Bayside Shakedown" - this one features Kim Rae-won as an elementary school teacher who falls head-over-heels for a Korean-Japanese jewelry designer played by Mirai Yamamoto. The flick hit the big screen in Japan on March 8, cementing Kim Rae-won's status there. Just how did he end up doing a Japanese feature film? "I received the script for 'Hanakage' directly from a Japanese production company that was interested in me", he explained. "After I read it, I thought that it was a warm and beautiful romance. So I decided to do it right away". He was quick to notice differences between the Korean and Japanese ways of making films. "There is a definite difference between this screenplay and a Korean one", he noted. "I guess it is a difference of sentiment". "But there is no big difference when it comes to people working and interacting with each other", he continued. "Practicing with the script, rehearsals ... If there is one difference, it is that, unlike Korea, Japanese movies are filmed very quickly". In Kim's mind, the Japanese media is not all that different Korea's, either. Save for the language barrier. "I think it's really similar to the Korean press", he said candidly. "I think that, because I have to use a translator with the Japanese press, I don't have an idea as to just how much of what I am trying to honestly say gets through". It's fitting that Kim would cite that as a primary difference. He seems to place a great deal of importance on his ability to communicate with his audiences. When asked what the best parts of being a celebrity are, he answered, "I think the pros are that a lot of people outside of Korea can see and enjoy my acting". Now, he has yet another opportunity to showcase his acting to people both in Korea and overseas through his upcoming drama "Gourmet" ("Sikgaek"). Slated to air in late May, clips for the food-based drama are already posted on Hallyu websites, including a little interview with the actor himself. When asked about "Gourmet" ("Sikgaek"), which he was busy filming at the time of the interview, he answered, "I think that "Gourmet" ("Sikgaek") will be a very well-made drama". "I am very confident about "Gourmet" ("Sikgaek")", he continued. "And I think it will educate people about Korea through its exploration of Korea's food culture. I believe "Gourmet" ("Sikgaek") will be a global drama that will highlight the essence of Korea and its people". Aside from this latest drama, Kim has plans to continue his work as an actor. "I will continue to do dramas and films", he said, adding that he plans to meet with his domestic and overseas fans. But his modest plans might need to be revised after "Gourmet" ("Sikgaek") airs. After all, what is more attractive than a man who can cook? Now that has international appeal. Super Junior-M, a sub-group of popular boy band Super Junior, is making its debut in China, Yonhap News reported. Veteran actress Kim Hye-ja and hallyu star Won Bin will star in a new film directed by Bong Joon-ho, renowned for local blockbuster "The Host".